Pakistan’s most prominent Jeep rally is underway in Cholistan desert, attracting thousands of visitors from all over Pakistan. 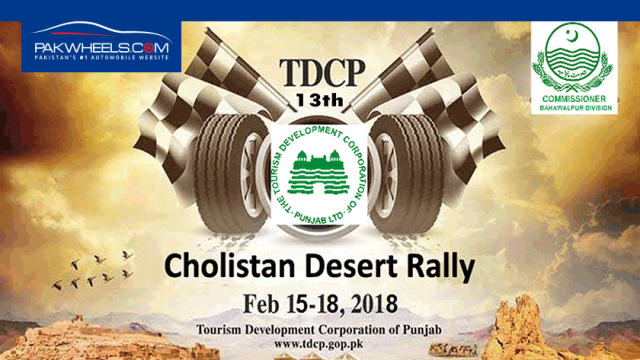 2018 TDCP Cholistan Jeep Rally was started on 15 February and will end on 18 February. The total distance of the Jeep Rally is 450 KMs and will cover three districts of Punjab, Rahim Yar Khan, Bahawalpur and Bahawalnagar. The Jeep rally is promoting the positive image of South Punjab while opening new doors for tourism. Furthermore, other than tourism, the jeep rally competition program was initiated to enhance the livelihood of the locals. It is the thirteenth edition of the rally, which clearly shows how famous the rally is; in Pakistan. Started back in 2005, it has grown now into a much more significant entity. The rally is divided into three different categories (Prepared, Stock and Women). Stock and Prepared categories are further divided into 4 categories (A, B, C, D). Below are the results of jeep rally (Stage 1) for 16th Feb 2018. Till now only the results of the prepared category have been announced for stage 1, the results of stock and women category are yet to be announced. It is pertinent to mention here that more than 100 local and foreign drivers (both men and women) are participating in the event. Additionally, this time around 50mn rupees will be distributed among the winners. Aside from the Jeep rally, at the end of the event entertainment programs such as fireworks will be shown to the public. Stay tuned to PakWheels.com for updates.